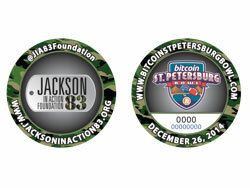 This commemorative Jackson in Action 83 Foundation coin, sponsored by Bitcoin St. Petersburg Bowl, provides the coin holder with discounts at local retailers while helping the foundation to support military families. After purchasing a coin, log on to the website provided with your coin to register your coin code and see a list of vendors providing discounts when you show the coin at their place of business. By becoming a member of the coin community, you’re also eligible to win prizes. A portion of the proceeds from the sale of each coin benefits the Jackson in Action 83 Foundation.